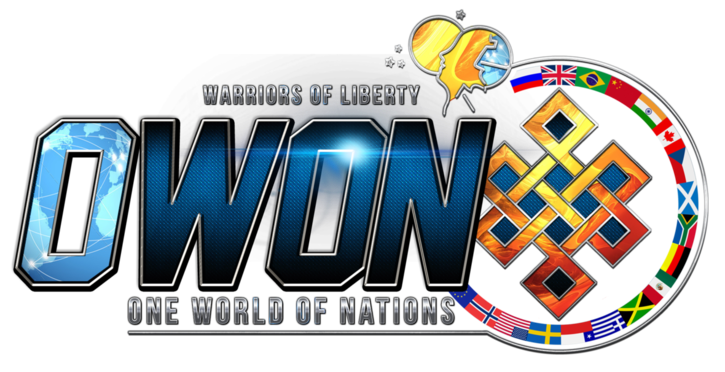 OWoN: The changing population of America. Sure you want to be there now? 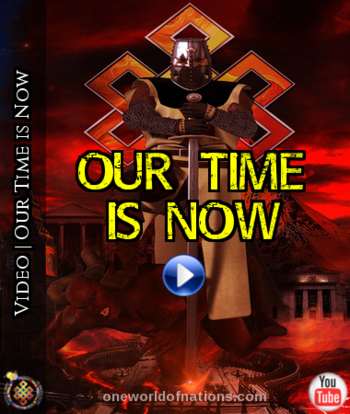 Have you seen how Europe is being torn apart by it? 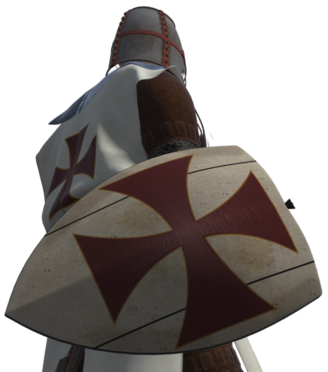 The nation is soon no longer yours. By the year 2020, 50.2percent of all children in the US are expected to be non-white, according to the Census. 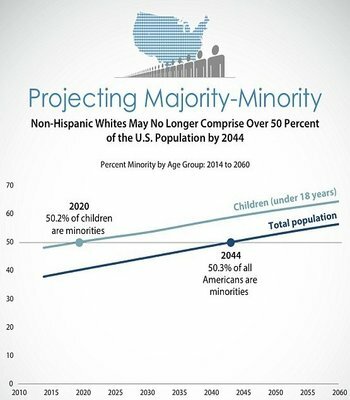 By 2044, whites will be outnumbered by minorities. The Census study, released this week, predicts that by year 2060, nearly 20percent of the population will be foreign born - thanks to an influx of 64million new immigrants. 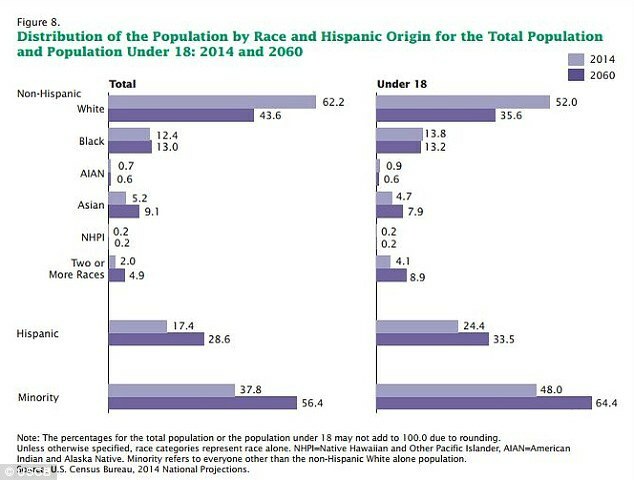 The populations of Hispanics in the US will rise 114percent - from 55million in 2014 to 63.6million in 2060 - making up about 29percent of the population. 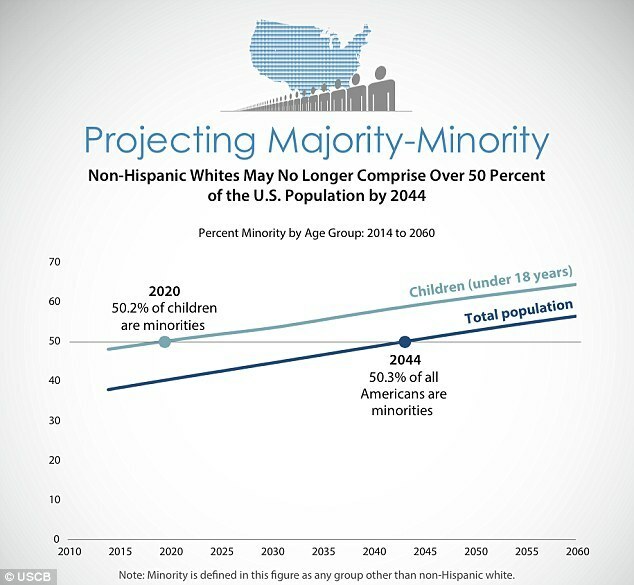 And the number of non-Hispanic whites will actually likely to decline over the next 40 years - from 200million and 62percent of the population now to 182million and 44percent of the population in 2060. The number of people who identified themselves as only black will also decline about 8percent to about 59million. The number of Asian-Americans will also increase dramatically - even more than the Hispanic population - rising 128percent to 22million. The Census reporty also projects a massive surge in the portion of the population that's over age 65. By 2030, 20percent of that population will qualify for a senior discount. In 2033, there will be more Americans over age 65 than children - thanks to the aging Baby Boom generation. By year 2060, there will be 76 'dependents' - those over age 65 and drawing government benefits or under 18 - for every 100 working-age Americans. Demographers estimate that by 2060, the population of the United States will increase by 98million - from 319million to 417million people. 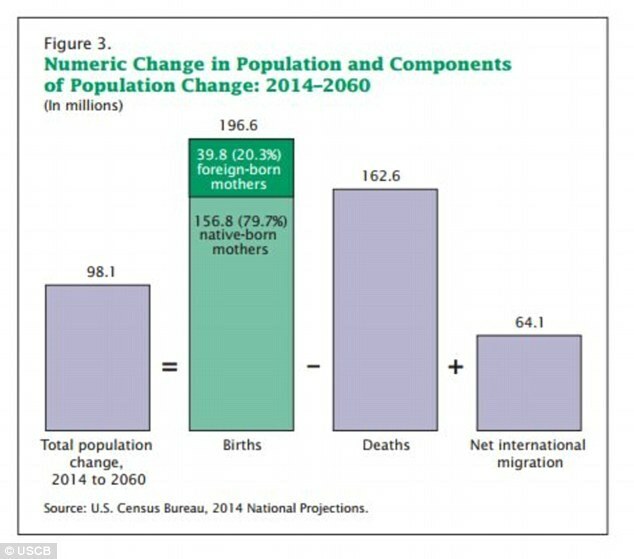 Even so, the overall population growth of the nation will slow considerably over the next 40 years - as immigrants and the children of immigrants reach higher incomes, their fertility rates will drop - like native-born whites have.